Fresh bean and tomato bruschetta with melanzane parmigane. Fresh pasta making including ravioli and gnocchi. Learn the secrets to great sauces to accompany any pasta dish. Delicious pizza making from the perfect dough to the final wood fired pizza. Learn how to make Braciola (a delicious rolled and seasoned veal cut). Ischian Coniglio (seasoned fresh rabbit). And on the final days learn a simple but delicious Tiramisu and liqueurs including Limoncello. For more involved classes we offer group specials, classes are limited to six people and are designed for those with a passion for cooking great meals with fresh ingredients. Please contact us for information on programs and package costs including accommodation, meals and classes. 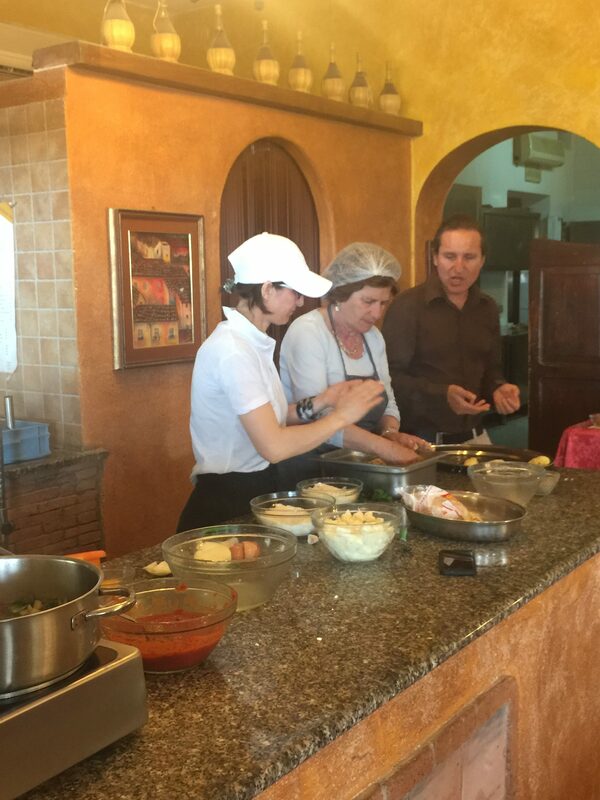 (Cooking Programs run the following dates: March 25th to november 9th (In the month of August no courses are available). See link for more info (MamaTina@LaCasereccia ) or feel free to contact us with your queries. However, if you are an avid fan of cooking, but a 6day course is not in your style, once-off cooking classes can be arranged if there is a group of you wanting to learn. We usually give the option of a starter, a main and a liquer or dessert. Email us for more info. Immerse yourself in the local culture visiting the food markets and selecting the freshest veggies, fruits, seafood, herbs and spices organically produced and self-caught by locals in Ischia and Naples alike. The island produces the most amazing aubergine (eggplants), tomatoes, peppers, potatoes, zucchini, mushrooms, lemons, berries etc. Another specialty on the island to which you might take a liking is rabbit. Mamma Tina cooks up a fine rabbit, done in herbs, garlic, tomatoes and olive oil. A favourite is to serve the sauce topped over a plate of buccatini pasta, followed by the meat as seconds. Something you can’t leave Ischia without trying at LaCasereccia.